Firmin was born in Paduch, Kentucky and currently resides in New Kingston, NY. 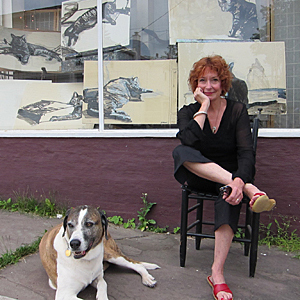 She also teaches painting/printmaking at the University of North Carolina School of the Arts at Winston Salem, NC and Truro Center for the Arts in Castle Hill, Cape Cod. Firmin is also on the faculty at SVA in the continuing education department. Her work is in several public collections including the New York Historical Society, Fleming Museum, Munson Williams Proctor Arts Institute, The Tides Institute & Museum of Art, University of Texas, Cape Cod Museum, and Hofstra University. Corporate collections include Pfizer, Meditech Corporation, Thomson Reuters, Bankers Trust, Odyssey, Fidelity Investments, Cablevision, and Zurich Insurance. Private collectors include Philip Glass, Night Shayamalan, Robert Rothchild, Jack Beal & Sondra Freckelton, and Tom Morgan & Erna Mc Reynolds. Selected publications include: American Artist, American Art Collector, McDougal Littell/LITERATURE, The Boston Globe, Art and Auction, Art of Our Town, calendar, 2006, New York Times, Arts Magazine, The Banner (Provincetown), The Albuquerque Journal, and the Sarasota Herald-Tribune.